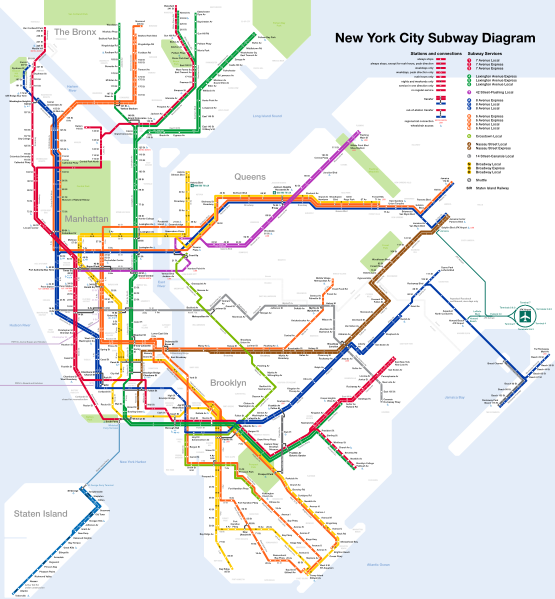 Navigating New York City’s massive subway system, seen above, can be difficult. Especially for those, like me, who are new — or newish — to the city. 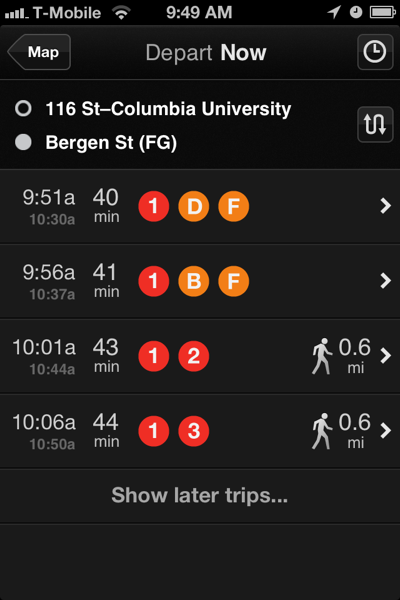 I use two helpful iPhone apps to streamline my various journeys. The first is called Embark. The stations are clickable. You simply 1) choose your starting point, then 2) choose your destination, as I’ve done in the screen shot above. When beginning, if you know which station is closest, you can simply click that stop. Or, if you need guidance, you can click a button and Embark will use your device’s GPS functionality to find the nearest station. Then the app will direct you, step by step, to that stop. 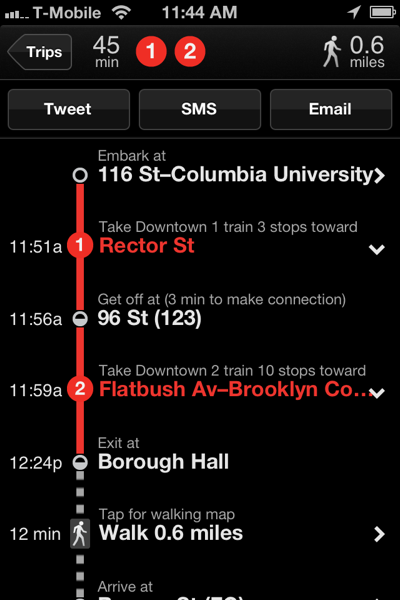 One especially useful feature is that Embark will re-route you in the event of subway service interruptions. So if, for example, a train stops running before you make your return trip, the app will automatically suggest an alternative route. You can read more about Embark’s design and functionality here. The second app I like is called Exit Strategy. It costs $3.99 and is available in iOS, Android, and Blackberry versions. 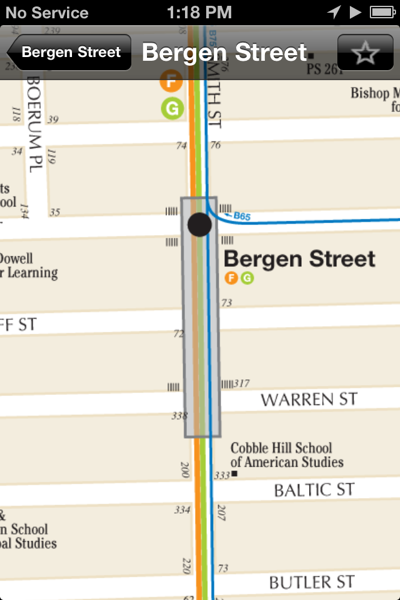 The app contains detailed street-level maps of the city. 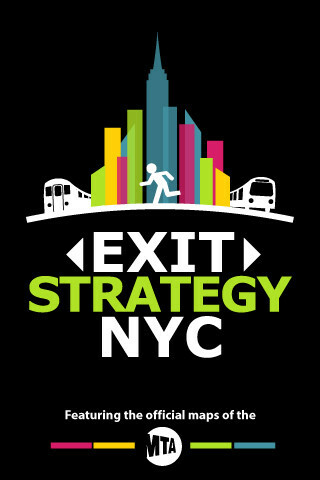 But I primarily use Exit Strategy for what may seem like a trivial task: figuring out which subway car to ride in so that I’m closest to the exit when I reach my final station. 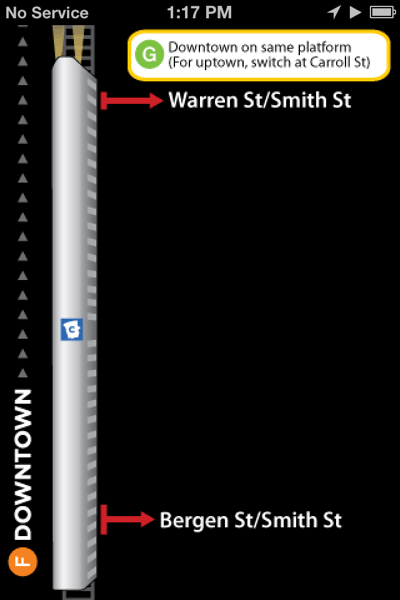 Some of the city’s stations are quite expansive, and have multiple exits. Knowing how to beat the crowds out of the station can save substantial time. 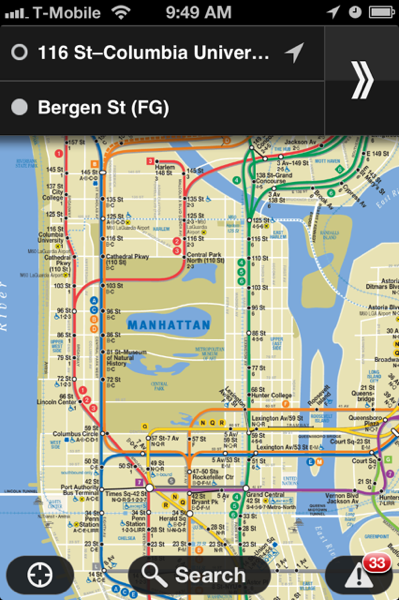 Readers who navigate NYC’s public transportation system: What are your favorite apps? Am I missing any gems?